Typically a series of 3 – 5 sessions are beneficial. 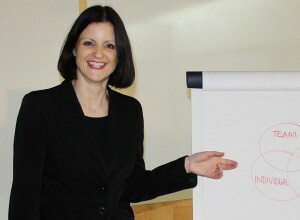 Alison has 26 years’ personal experience of managing diverse teams. She combines this with her extensive business understanding and coaching qualifications to provide a supportive yet challenging environment, in which teams can measure their current level of performance and determine how to develop it further. Alison understands how difficult, yet crucial, it is to sustain team unity and effective communication during busy and challenging times. Alison listens carefully and uses insightful questioning to understand the unique challenges that the client faces, before designing a bespoke Team Coaching session or Event to deliver their desired outcome. Alison’s practical and enthusiastic approach ensures that Team Coaching is both effective and memorable. “I particularly valued the work she did to support me in merging two separate managerships. I approached Alison to help me in forming a united management team (2 from one department and 4 from the other including 2 new appointments). I wanted to explore individual strengths and personality preferences in MBTI styles for the first time as a team and encourage openness and discussion around the challenges of being able to collectively maximise these in the leadership of the department. Alison designed a bespoke session tailored specifically to my requirements and facilitated a half day that encouraged honest and specific practical discussion in groups, pairs and trios. With exercises she brought the theory to life for example using balloons and flip charts to capture what we appreciated in each other. In depth she covered our preferences for communication, team culture, leadership, change, problem solving and stress.